My grandmother always called me a “plunderer.” I preferred to call myself an explorer, I just explored closets and chifferobes, kitchen cabinets and junk drawers. You never knew what you might find in a dresser drawer at Mimi’s, stray pennies, nails, jar lids or rubber bands. And in the early 1960’s the curiosity and snoopiness caused no doubt by my plundering gene hadn’t diminished much. I went shopping one Saturday afternoon for inexpensive pots and pans, cereal bowls and silverware. My household budget was fairly small. I had dropped out of college to get married and although my family graciously threw me a bridal shower, these more mundane items weren’t among my shower gifts. I browsed through the stores of downtown Florence, deciding to comparison shop a bit before making my selections. My little notebook was getting crammed with descriptions and prices of current needs plus future wants as I walked out of the back door of Kresses, meaning to cross over to McCown-Smith Department Store. It was a pretty day, I was in no particular hurry, so I decided to stroll north on Dargan Street. I made note of several places I might like to check out later, especially the shoe repair shop. I paused at the end of the block in front of the Army-Navy Store. No pots and pans were visible through the window glass, so I turned to cross the street and discovered a treasure — Rogers Brothers Furniture. The front of the store seemed completely open to the street. Blue and black enamel cook pots, brooms and mops, mop buckets and chamber pots sat on the sidewalk and floor, while small tables held stacks of thick white china plates and saucers and cups, assorted farm utensils interspersed with more housewifely gadgets. One side of the entrance was lined with leaf rakes and circles of garden hose. Hanging high on the walls were a variety of household items like coils of clothesline and sacks of clothespins. Rogers Brothers Furniture had more than furniture! To a born plunderer, Rogers Brothers seemed a virtual paradise to browse through and snoop in to my heart’s content. I entered the store proper and found the furniture: dining room tables that could seat ten or twelve, overstuffed sofas, white metal kitchen tables and straight-back chairs, dark wood end tables and tall skinny magazine racks. There were stacks and stacks of wood furniture, some shiny and expensive looking, some pretty ordinary and more my budget. In between larger pieces were small rolled-up throw rugs and larger rolled-up lengths of linoleum in floral patterns of pink, green or yellow. No amount of space was wasted in that store. As I explored, I stopped and counted the items in one furniture pyramid that rose to the ceiling. Anchoring the bottom was a dining room table, a smaller kitchen table topping that. Then came several kitchen chairs fitted into each other like a jig-saw puzzle, two end tables laid on their side atop those, with one large table lamp crowning the peak. Milk-glass what-nots and large ceramic ash trays covered what space was left over on the bottom tiers of the pyramid. Multiple furniture pyramids occupied the store front to back, some with sofa bases, some with armchairs, but all decorated with knick-knacks galore. Nestled here and there among the various pieces of household furniture were man-of-the-house tool chests and lady-of-the-house tool kits. Stacks of hand towel “seconds” wrapped with cord ready for the yard mechanic’s use lay next to kitchen towels and washcloths for the housewife. As I slowly made my way toward the back of the first “aisle,” I found the kitchenware. Laid out helter-skelter on top of a table were piles of pots and pans of every size, plus soup bowls, spoons and forks, and more stacks of plates and cups. None of the pots came with lids, but that was okay. Over on the floor to the side of the table was a large pasteboard box overflowing with pot lids, metal or enamel. Everything on my shopping list was right there, all well within my price range. One of the twin Rogers brothers spotted me and came over, asking if he could help me find anything. He pointed out other sections of the store for me to peruse, including books! An old wooden bookcase stuffed with water-stained paperbacks, recipe books with loose pages and out-of-date magazines attracted me like a magnet. I spent a very pleasant few minutes tugging books and magazines out to look over, finally adding a Fannie Farmer paperback recipe book with browning pages to my stack of purchases. A practical purchase it proved to be over the years, held together in its last days with rubber bands. When I finally left the store with my finds, I had acquired several more items than on my shopping list, including the recipe book — isn’t that always the way? I still have the assortment of pot lids I bought that day, although the cook pots they were bought for wore out long ago. Some years later Rogers Brothers moved to a larger location in the center of that block, and later still to a location on the edge of town where the family business morphed from furniture to fabrics. I browsed through there one day, but it wasn’t nearly as much fun. I still have fond memories of my shopping trips to Rogers Brothers on North Dargan Street. I’ve never found another plunderer’s paradise quite like that one. Note: The photos are not of Rogers Brothers Furniture, alas – I couldn’t find any from those day. 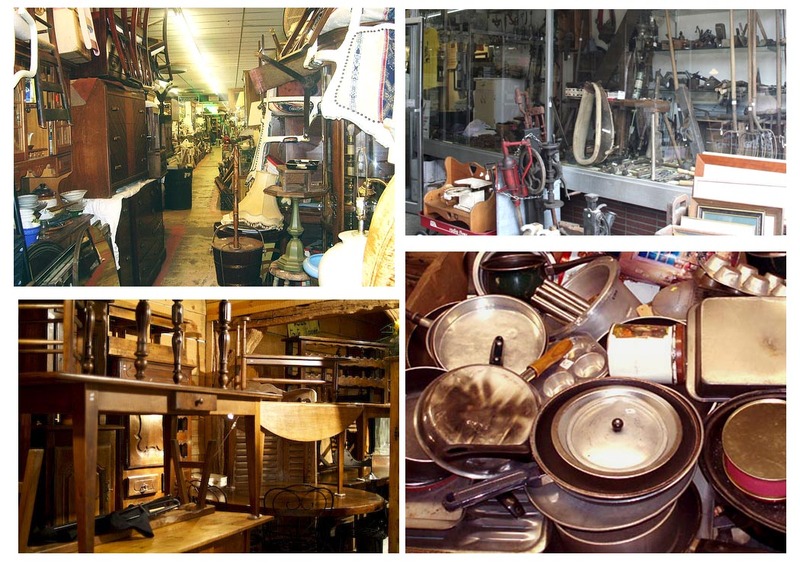 These are internet photos of similar shops across the country, still popular with young housewives and curio collectors. This entry was posted in 1960s, Downtown Florence and tagged furniture, old books, pots and pans, Rogers Brothers Furniture. Bookmark the permalink. Another fabulous story Bette! I do enjoy your memories! Keep writing more!